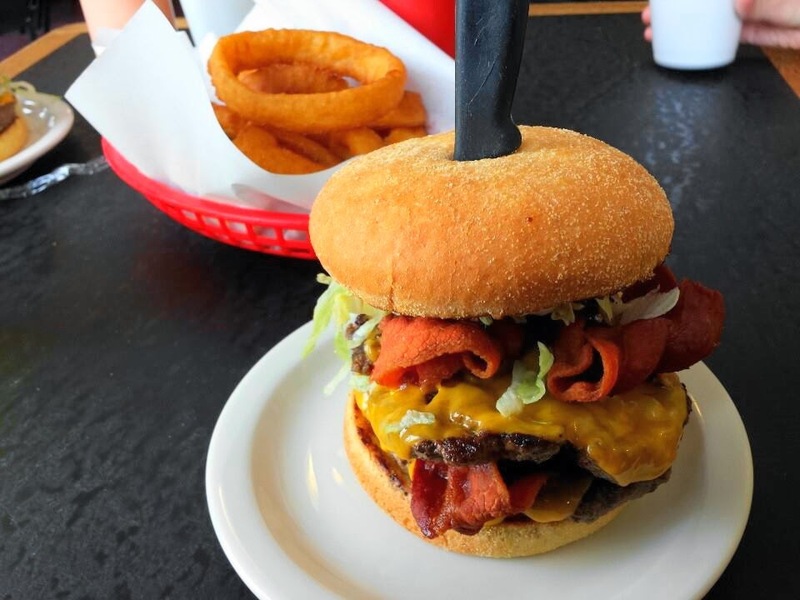 Treasure Valley Treats and Tragedies: Letting the food speak for itself. Mostly. Letting the food speak for itself. Mostly. Just so we're clear, that isn't me being cute. That picture is of the "Wanna Cluck Around?" sandwich from Voluptuous Vittles that I was lucky enough to try a few Rallies ago. The components are: breaded chicken, Belgian waffles, pepper jack cheese, and honey mustard. 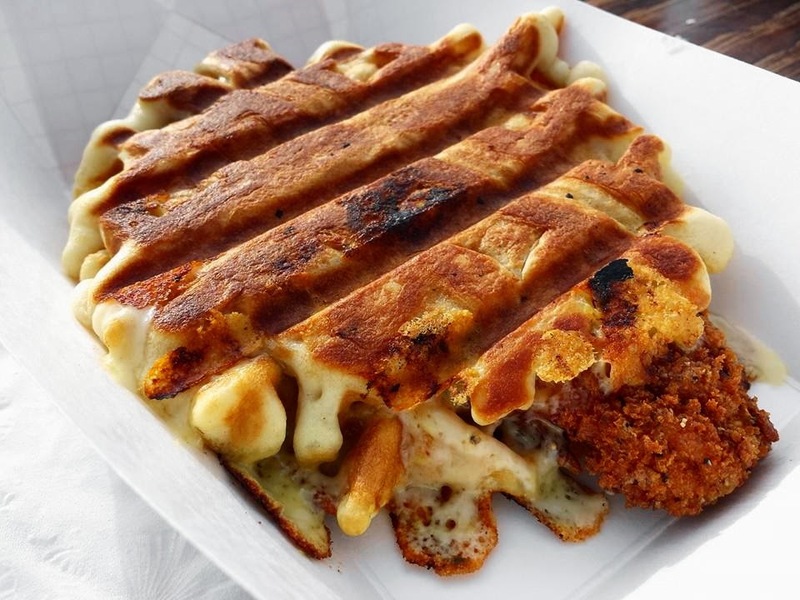 All of that is thrown together and smashed in a sandwich press, resulting in a savory chicken and waffle panini. Very yummy, and probably a good gateway dish for those who aren't quite ready to try the more standard chicken and waffles yet. The picture above is of a recent addition to Cacicia's menu, and I'll let the guy who runs the show explain it: A bed of fresh romaine, spinach, signature bruschetta, all the sautéed, farm-fresh vegetables your heart desires, and our 140 year old traditional family house-charbroiled meatball patty. 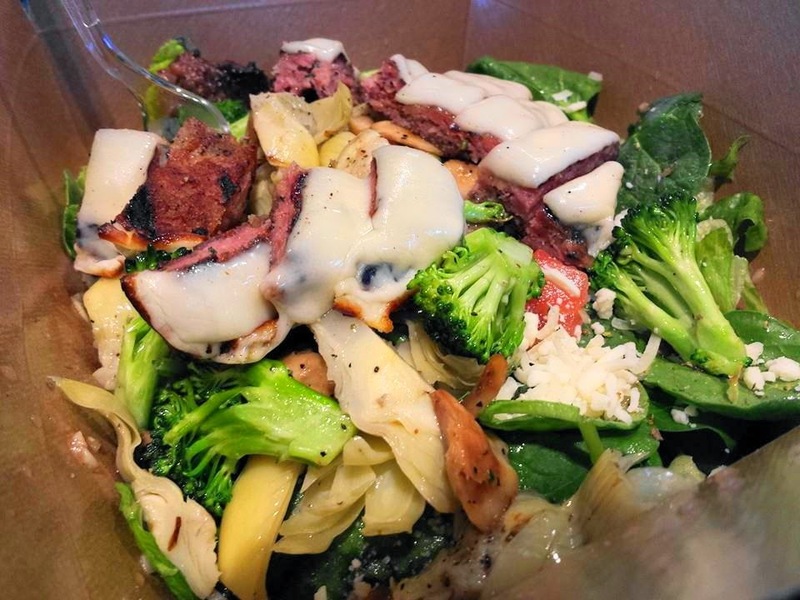 Topped with provolone and our house vinaigrette! Zen Bento is one of my favorite places to grab a quick lunch for an impromptu picnic at the park. 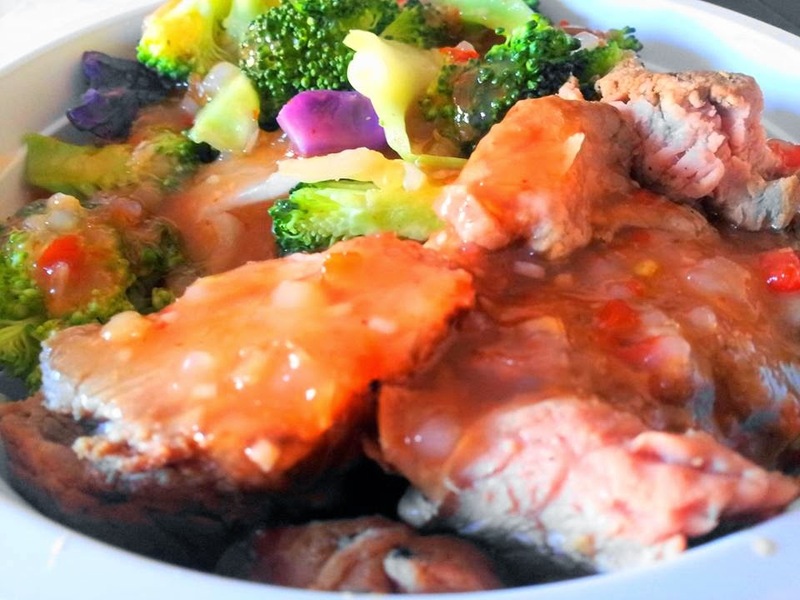 There are several bases, proteins and sauces to choose from, but the one above is my current favorite: brown rice, steamed veggies, and pink slices of beef in a moderately spicy sweet chili sauce. I don't catch up with the lovely ladies at Cake Ballers very often. There are a number of reasons for this, including but not limited to the fact that they're Downtown and have very limited hours. 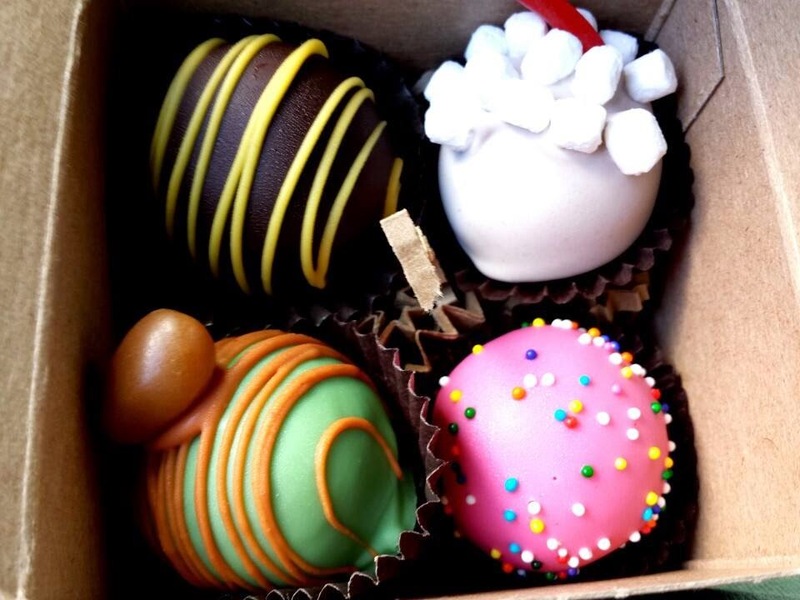 Plus, it's not often that I crave sweets. The last time I visited, I made a special effort because they were selling the "Circus Sampler" you see above. Clockwise from upper left, you're looking at chocolate-covered banana, root beer float, cotton candy, and caramel apple. These women do for bite-sized, frosted balls of cake what Jelly Belly does for jelly beans. 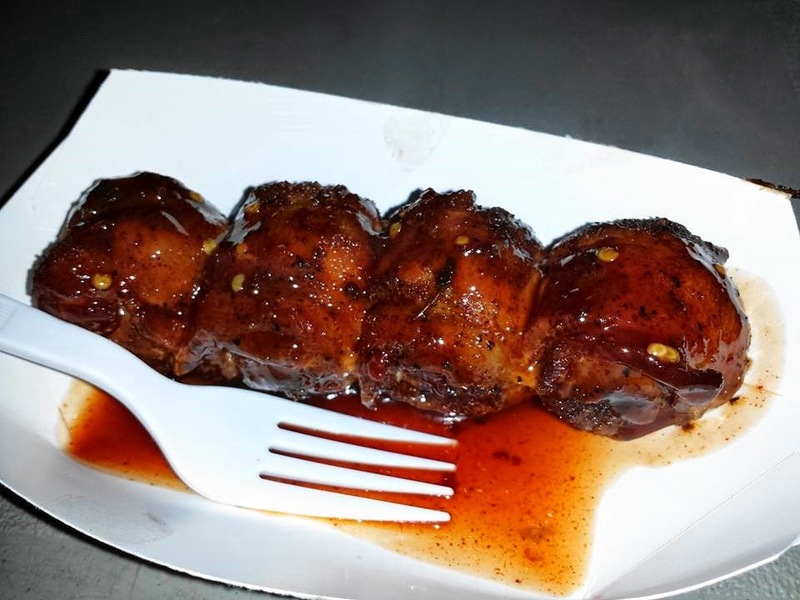 Another one from a relatively recent Food Truck Rally, and in keeping with the balls theme for the moment, those little delights you see above are bacon-wrapped meatballs in surprisingly spicy sauce. If you like your food with beer, this dish was pretty much created for such a pairing. Courtesy of Rolling Hawg Smokers, another truck I hope to see more of as the weather continues to improve and the West End Food Park inches ever closer toward becoming a reality. Yen Ching is arguably the best Chinese restaurant in town. I only say arguably to be nice, there really isn't anyone else on their level around here. As much as I love Wok Inn Noodle for what they do and Jade Horse for my buffet fix (damn my childhood nostalgia), nobody else offers the variety, quality, or dim sum that Yen Ching does. 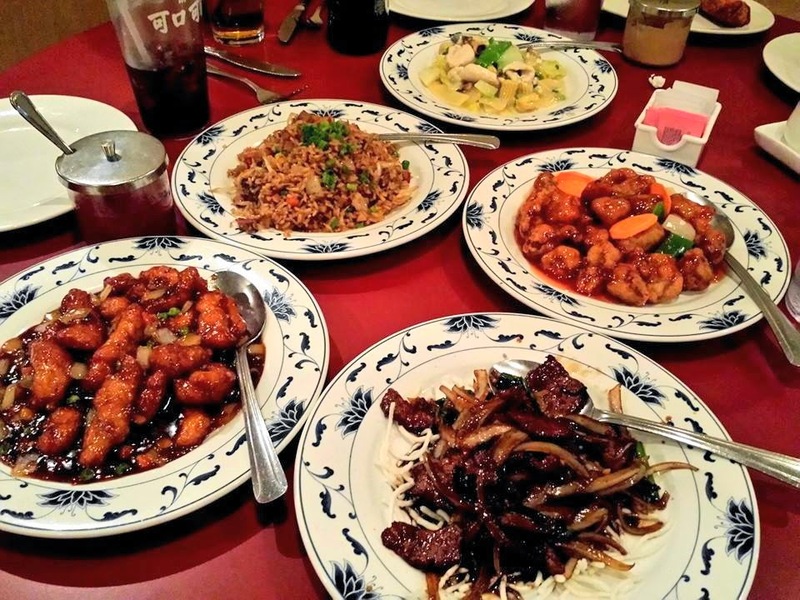 This was from our first time trying one of their family dinners, which included (clockwise from the top) Snow White Chicken, Sweet and Sour Pork, Mongolian Beef, Mandarin Spicy Chicken, and Pork Fried Rice. We also had Egg Rolls, and Pork and Seeds, but there wasn't enough room to fit it all in the picture. 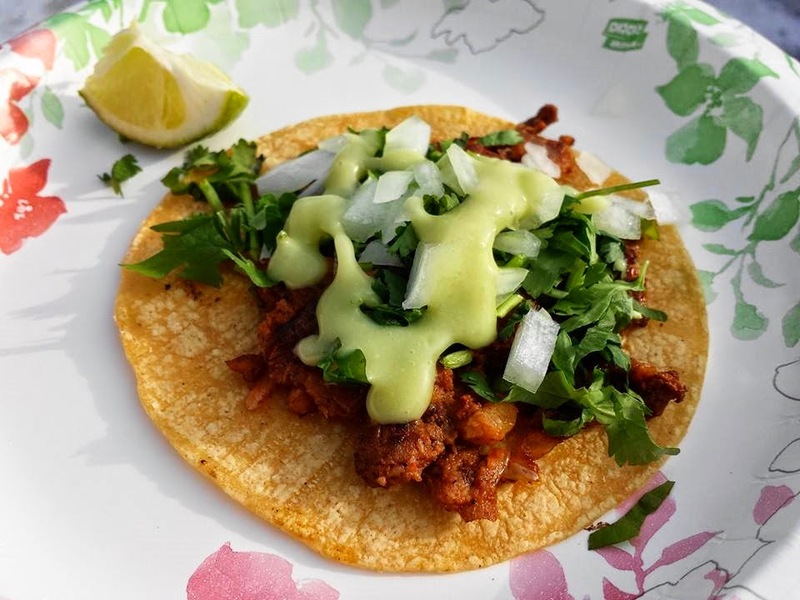 I didn't even try this and to be honest, Basilio's food is generally too salty for me, but this is the item that finally sparked an interest in taco trucks in my roommate's tween daughter, and that's worth something! 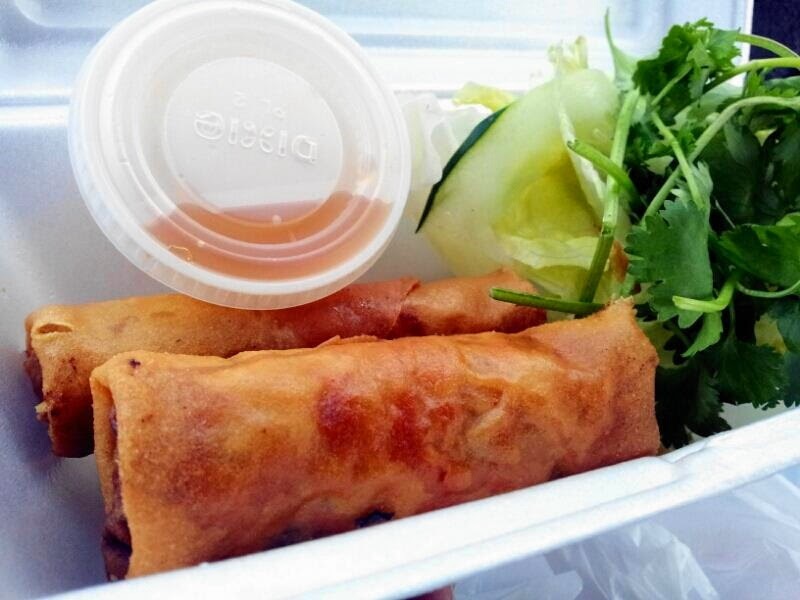 What you're looking at there are Vietnamese egg rolls from Pho Tam. This proves I order them someplace other than RiceWorks. Pho Tam's aren't quite as good, but then again RiceWorks doesn't have pho, so what can you do? 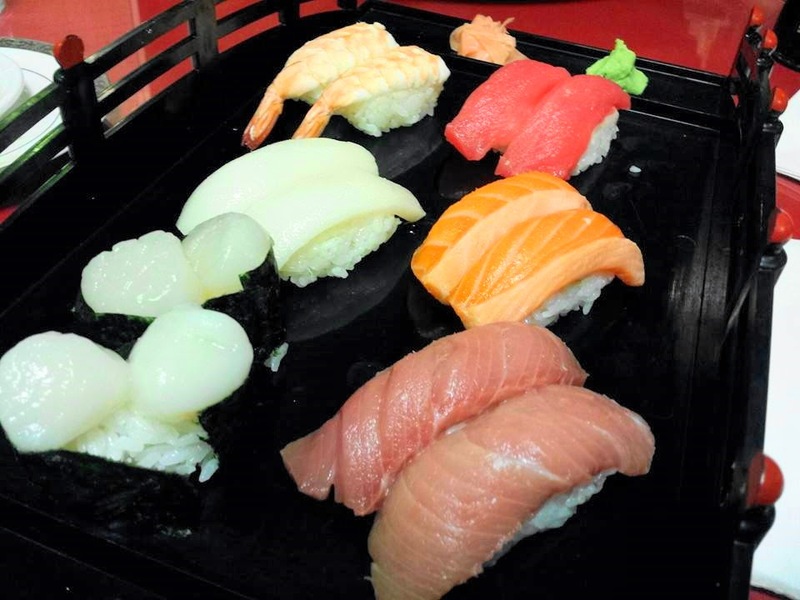 That's a sushi platter from Shige's Japanese Cuisine. What else is there to say? The man is king for a reason, right? Unfortunately, I do have to recommend sticking to the Boise locations, as Shige Teriyaki has gone the way of the dodo and Shige Express in Meridian has gone way downhill. 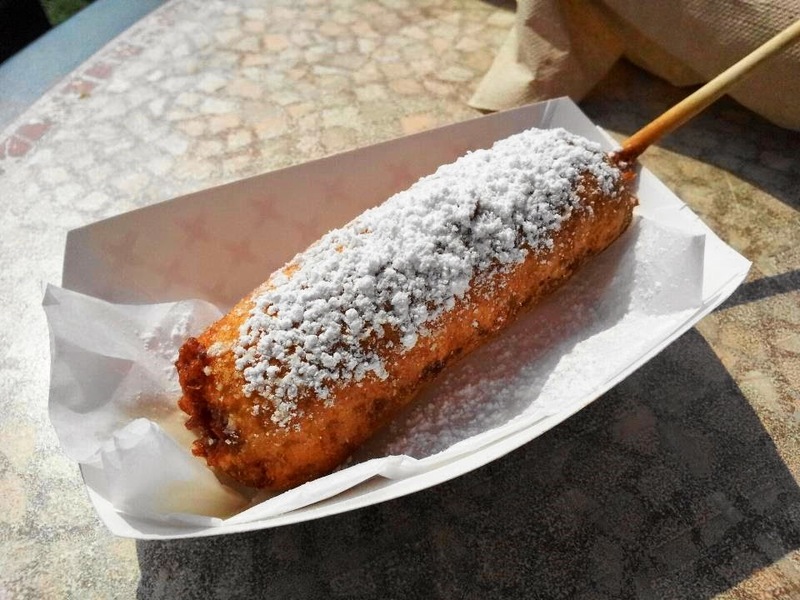 That up there is a deep-fried Snickers bar. With powdered sugar. On a stick. I know you're afraid, but it's okay. It was actually really good. Stuff like this is one of the main reasons to visit the Western Idaho Fair. Yeah, that's another dish from Lorena's Mexican Grill. How much do I love that woman's food? If I won the lottery, I would hire her as my personal chef. Then when I got too fat to stand up, I would buy a restaurant for her to run and hire a personal trainer instead. I know, I know, everyone hates chain restaurants, and there IS a lot to hate. Still, I've always loved The Cheesecake Factory, and this dish I ordered on a recent brunch outing is the kind of thing I love about them. 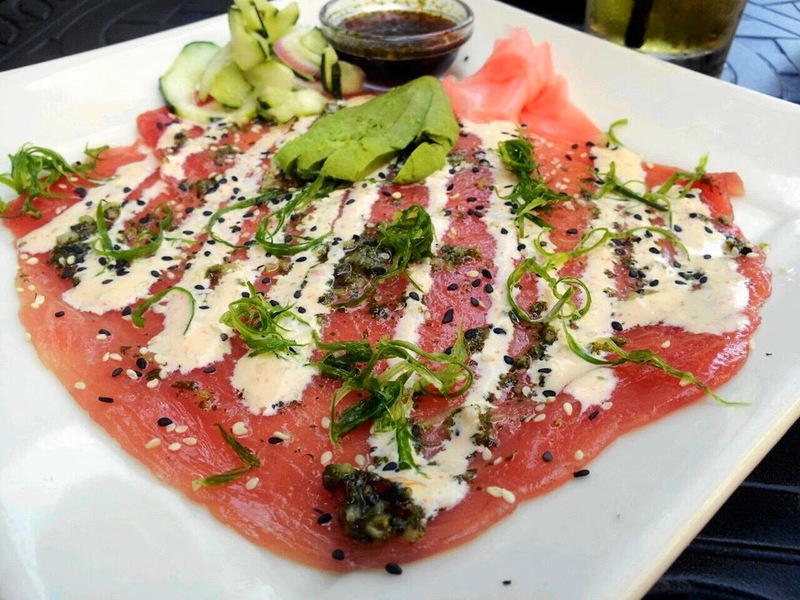 Super thin-sliced raw tuna, wasabi pesto, togaroshi aioli, and a little avocado for good measure. Where else am I gonna get this kind of stuff at breakfast time? 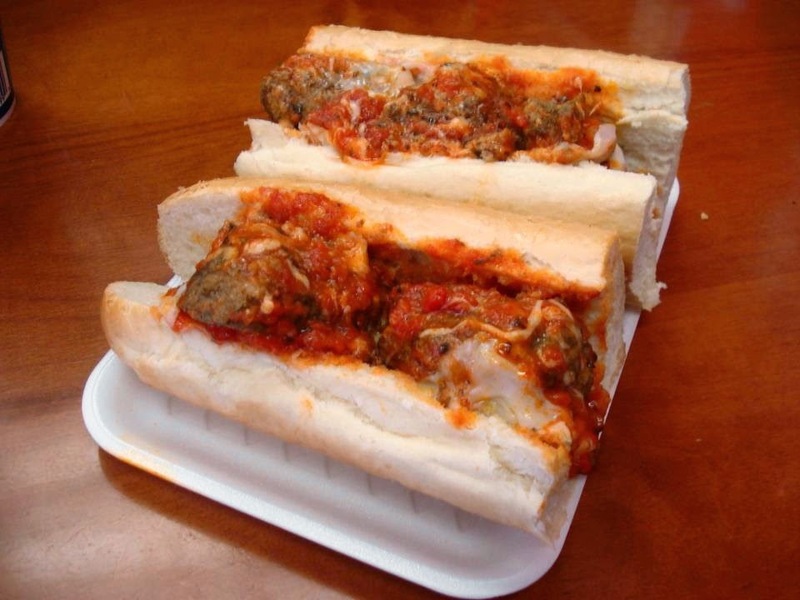 There are a lot of places to get a decent sandwich around here, but to me there's just something special about Uncle Giuseppe's. Authentic people, authentic food, generous portions. I've never had anything bad here, so really you can't go wrong. Another thing I don't make it to enough are the various ethnic food festivals in the Boise area, because honestly they generally seem to be put on by churches located in hard-to-access areas with crappy parking. Not to mention the bizarre payment systems. I did finally check out the Greek Festival, which turned out to be totally worth it. 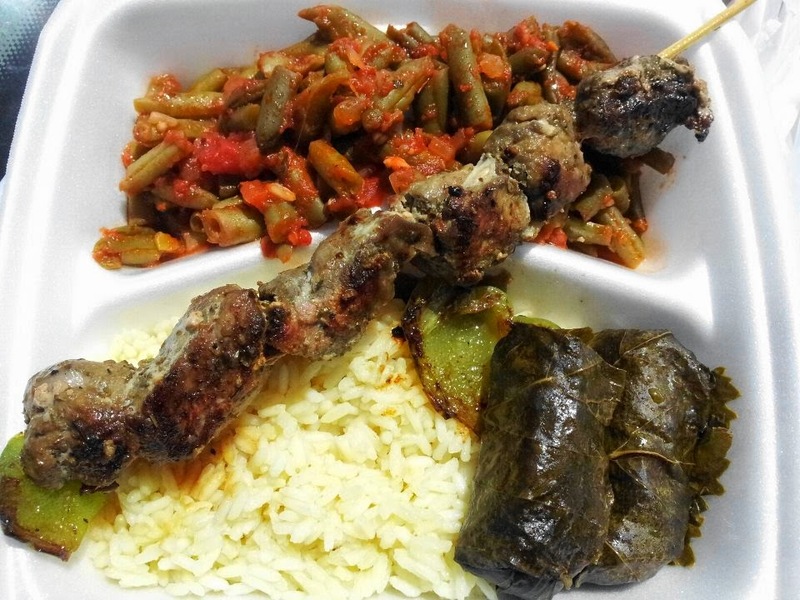 The lamb was great, the veggies and rice were good, and the dolmathes (dolmas? dolmadas?) were some of the best I've ever had. With this year's festival coming up in less than two months, it's pretty safe to say I'll be returning. You know, when EVERYONE says that a particular place is the best in town, it makes me MORE wary of it. Big Jud's is one of the few places that lives up to their reputation. What you see there is the best diner-style burger in town, in this case a double bacon cheeseburger (which at Jud's means double the deep-fried bacon as well!) and a side of onion rings. There's nothing more to say, just go. Seriously, the hype is valid. 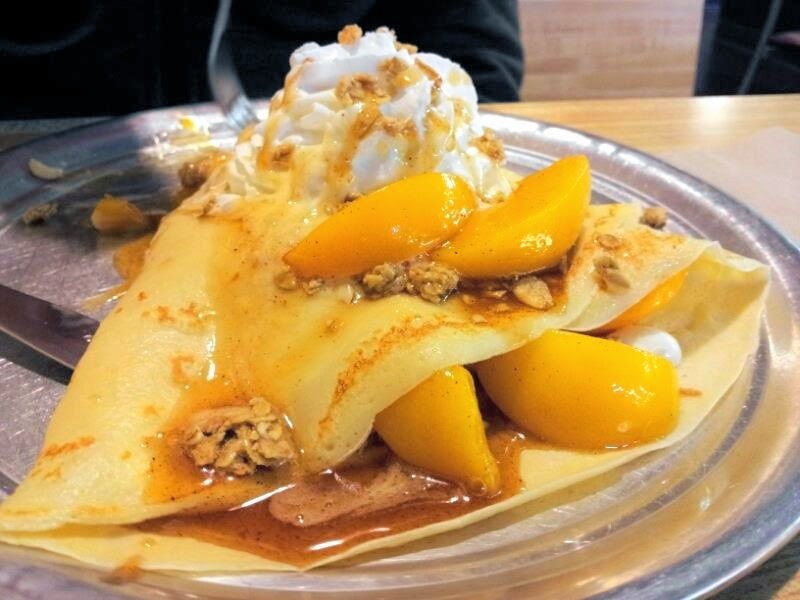 I have yet to visit The Creperie since it morphed into The Creperie Café. I don't know if there has been a change in ownership, but I do know they sell coffee now so I definitely need to make it back. I didn't eat this crepe though, that was the roommate. Pretty though, ain't it? Once upon a time, there was a sandwich shop in Meridian called 2 Fat Guys Fresh Deli. I had visited them twice and was in the process of writing the review when weird things started happening on Facebook. As well as I understand it, first the owner said that the restaurant was closed indefinitely due to his chef and the rest of the staff quitting by text message. Then he indicated that he was working on re-opening. Then the Facebook account just kind of vanished. A few weeks later the chef re-opened as Fat Guy's Fresh Deli, in the same place and with the same menu, and things seem to be running a lot smoother now. Still, I feel like I should just start from scratch on the write-up, but in the meantime here's a pic of one of their amazing sandwiches. That's roast beef, bleu cheese, bacon, pesto mayo, and au jus for dipping. Messy and absolutely delicious. 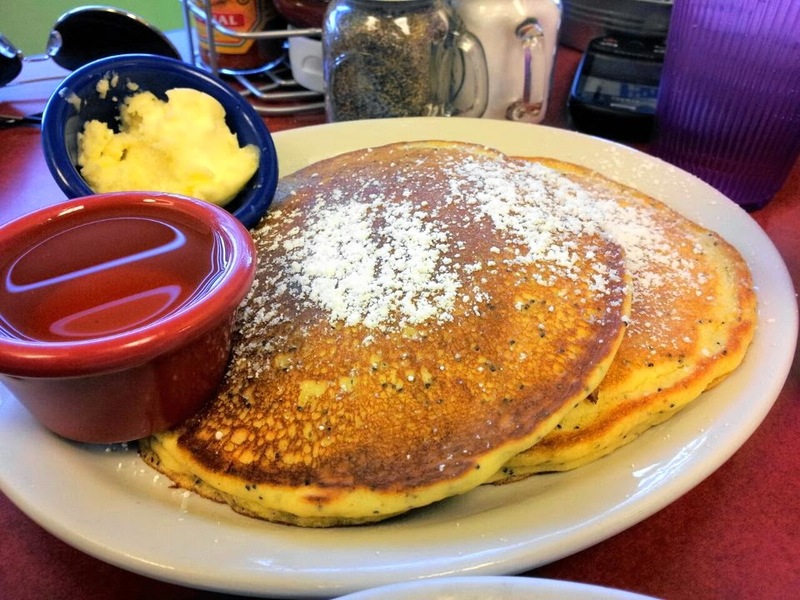 When I reviewed The Egg Factory, I described how amazing their gingerbread pancakes were. I couldn't think of a more perfect use for the lemon syrup until these lemon poppyseed pancakes came along. To be succinct, just order anything they happen to be serving that day that comes with the lemon syrup. I always do, and I haven't been disappointed yet! Grilled Cheese and Tomato Soup. I promise! Archie's Place has always seemed to have fun playing with classic comfort foods, serving them up in new ways. One of my favorites was the deconstruction of my absolute favorite childhood lunch, grilled cheese and tomato soup. 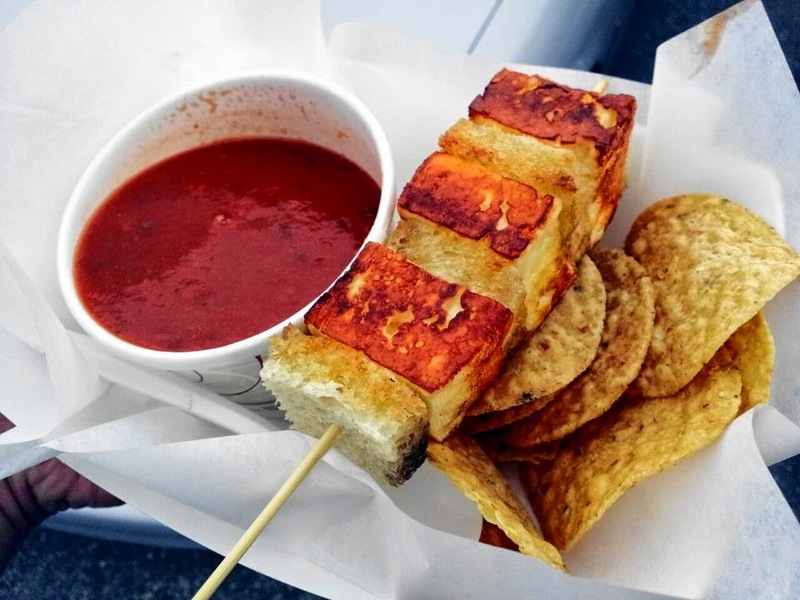 In this case, bread and halloumi cheese were cubed, skewered and grilled, and served with a side of heirloom tomato basil soup for dipping. 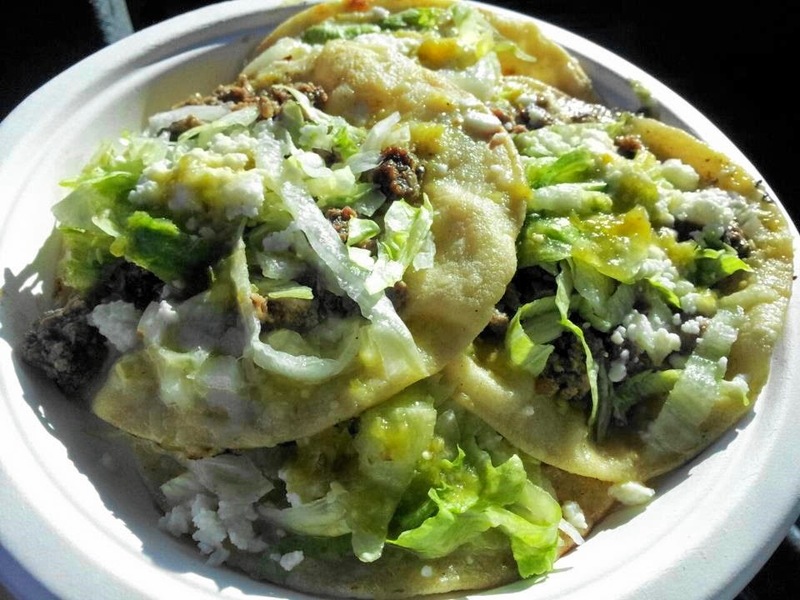 Every time I go to a food truck event where Archie's will be, I hope to see these on the menu again, including the Meridian rally that's happening in less than an hour. Fingers crossed! Another festival coming up in June is Deli Days the Idaho Jewish Cultural Festival. 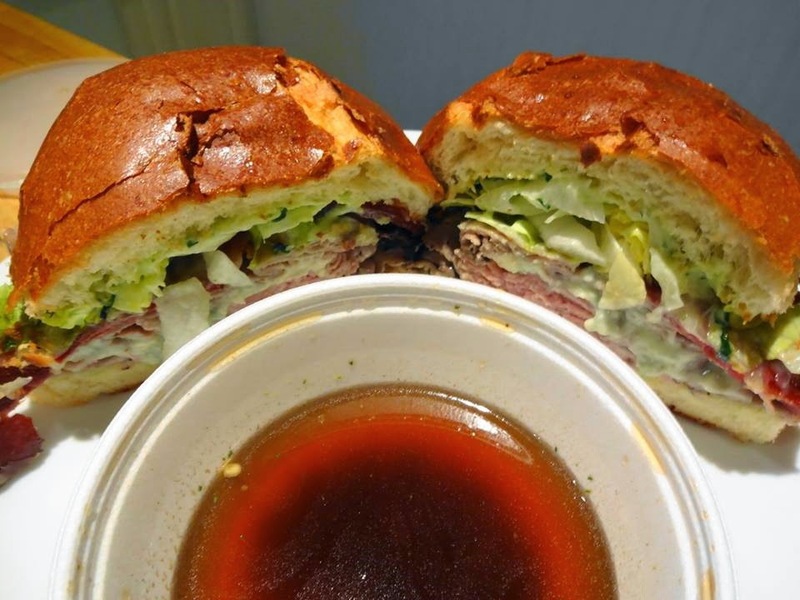 I tried a few things when I went, disliked the pastrami sandwich (yellow mustard, seriously? 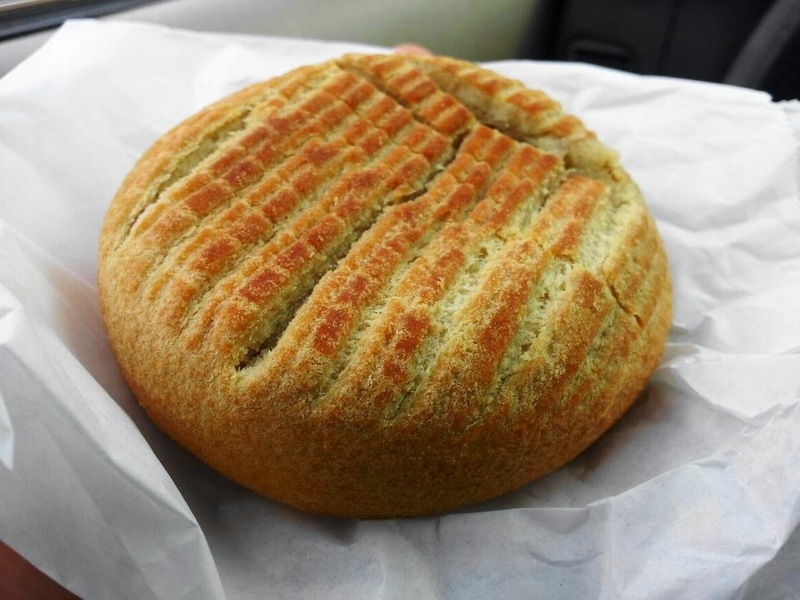 ), dug the bagel with lox, but my favorite thing was probably this potato knish. What can I say, I'm just a sucker for stuff like this. Aspen Leaf (which may be a U-Swirl by now) is a favorite of my roommate's children. Probably because we don't let them get toppings at TCBY where they're metered out one by one. 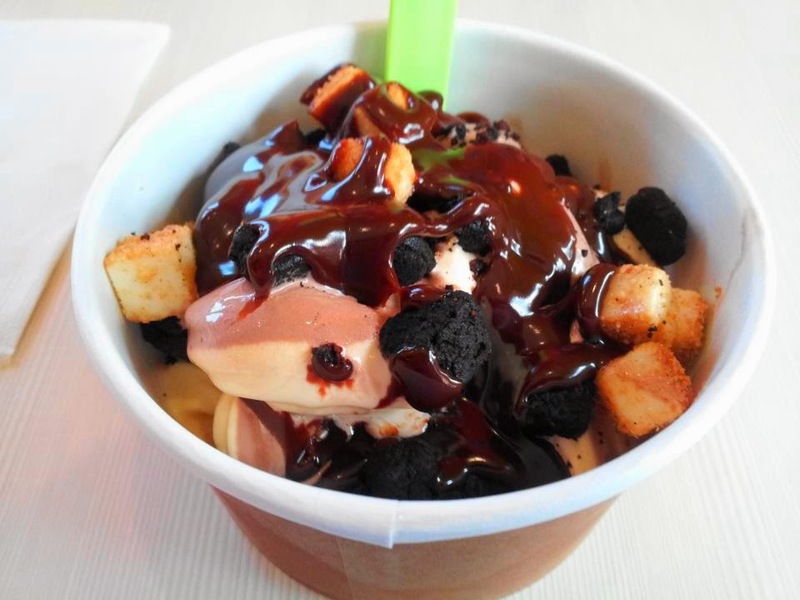 That mess you see above is brownie batter and New York cheesecake yogurt swirled and topped with brownie bites, cheesecake bites, and hot fudge. Yes, I tend to be thematic with my desserts. This seems like an appropriate one to end on. 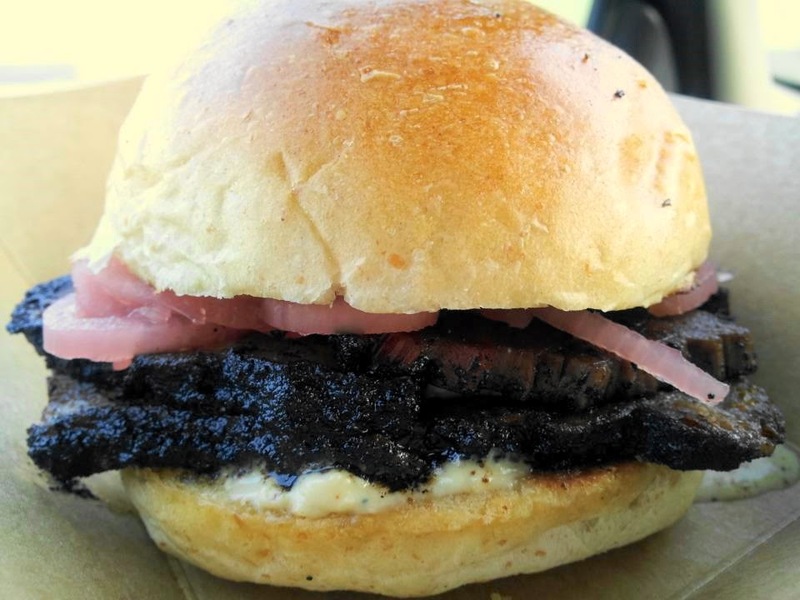 You can't get Saint Lawrence Gridiron's food, such as the delectable brisket sandwich with pickled red onion and gorgonzola sauce pictured above, for the moment because the truck has gone bye-bye forever. However, very soon you will be able enjoy Brian's meaty creations in an honest to goodness restaurant. I hate to lose an amazing food truck, but I guess I can trade it for this man having access to a full kitchen. Can't wait to see what he'll turn out! That's it for now kids, but remember: some of this stuff (or even better stuff) is available right now as you're reading this, so get out there and grab some for yourself! I love this mish mash of reviews and food photos. Gives me a little info about a lot of places I can put on the must try list!